and leave the rest to us. The process of achieving a CSR Accreditation begins with your own assessment of every aspect of your organisation’s CSR activities. No matter what size your business, large or small, you submit an application based on our ‘Four Pillars of CSR’ and the assessment guidance notes. Please remember that it is not essential that you deliver CSR activities in all four of the CSR pillars or everything on the associated lists, this is just a guide to help you structure your application. An appropriate fee is charged based on your company size. The CSRA panel assesses your application and responds accordingly. All successful applications will receive a Gold, Silver or Bronze Accreditation pack. Any applicants that are unsuccessful will receive a gap analysis report on their application and a chance to re-apply before the Assessment Panel next meets. Use the four pillars together with the assessment guidance notes to help you when submitting your application. You may also identify practices that are not shown by the four pillars. Please include anything you consider relevant.We are interested in all and any activity which benefits the environment and community. Focuses on eco-issues such as climate change. Businesses work with other organisations to improve the quality of life of the people in the local community. Policies that improve products and services and staff. Support charities through volunteering, donation or sponsorship. Familiarise yourself with requirements of the assessment guidance notes. Look at what you already have in relation to what the four pillars. Carry out a gap analysis to identify areas that need addressing. Re-assessment within 3 months will incur an admin fee of £75,00. Subsequent to successful CSR Accreditation three year re-assessment is discounted by 20%. Failure to pay the CSR Accreditation fees by the given deadline on the invoice will result in suspension and the possible withdrawal of the CSR Accreditation. Prompt payment to suppliers is good CSR practice, so we expect invoices to be settled in 30 days. Please register for your CSR Accrediation Application first. 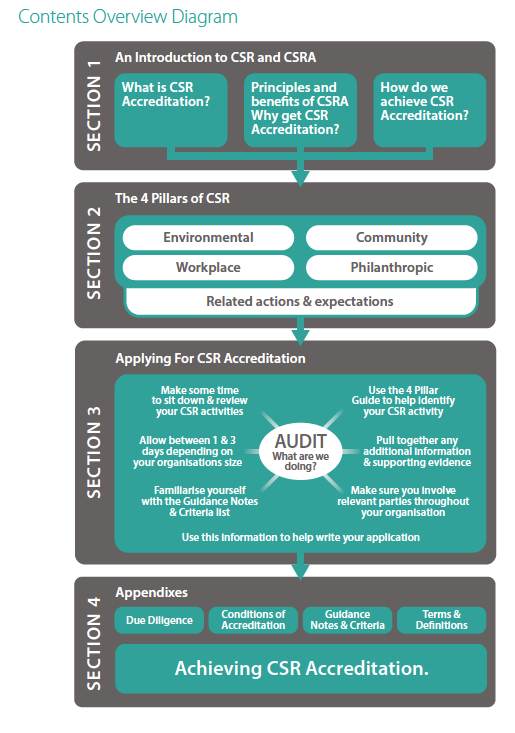 This will provide you with a Guide that will help you with your CSR Accreditation application. Create an inclusive program of CSR activities that staff can engage with and feel proud off. Increase sales and customer loyalty, operational costs and overall better financial performance. By reducing resource use, waste and emissions, you can help the environment and save money. Increase your attraction for new employees or retain existing staff.